The Boston Bruins and Montreal Canadiens met for the second time this season, however, unlike last time, Montreal would come away with the victory. Montreal striked first as Tomas Plekanec got a a powerplay goal assisted by former Bruin Michael Ryder and Boston public enemy #1, P.K. Subban. A minute later, Tyler Seguin evened the score board on a tap in from Patrice Bergeron. Montreal answered back right away as David Desharnais scored on a puck that went off Boychuck's stick and then went off Desharnais skate. The second period was all Bruins as they pulled ahead 3-2 off a Patrice Bergeron goal and then a Dougie Hamilton rip. 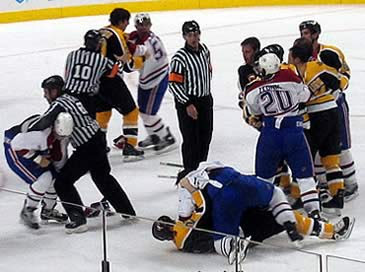 At the end of the second, tempers started to flare as Milan Lucic and Brandon Prust scuffled. 30 seconds later Zdeno Chara man handled Alexei Emelin after an apparent cheap shot on Seguin. Chara was granted a 2 minute instigator, 5 minute fighting major and 10 minute game misconduct. The third period saw two Montreal goals. The first was from a Max Pacioretty shot from the point. Tuukka Rask could not see it through the screen. The game winner would be sort of a garbage goal as David Desharnais cleaned up the loose puck infront of the crease. However, earlier in third period Shawn Thornton would have two big hits, with the best being on P.K. Subban. Montreal argued for a penalty, but the refs weren't having it. With 7 minutes left to go the refs called off a delay of game saying the puck was tipped out of bounds, but replay evidence showed it wasn't. Second game in a row for the refs....let's see if they can make it three on Tuesday. Tuukka made 22 saves on 26 shots, a .846 save percentage. I guess you can say his struggles vs Montreal still exist. The Bruins finish the homestand 2-1 and next play Tuesday night in Washington, their first meeting since the devastating playoffs series last spring.